Floyd Mayweather Jr. (50-0, 27 KOs) looked old, slow and weak tonight but he was still able to wear down and halt novice fighter Conor McGregor (0-1) in stopping him in the 10th round on Saturday night at the T-Mobile Arena in Las Vegas, Nevada. 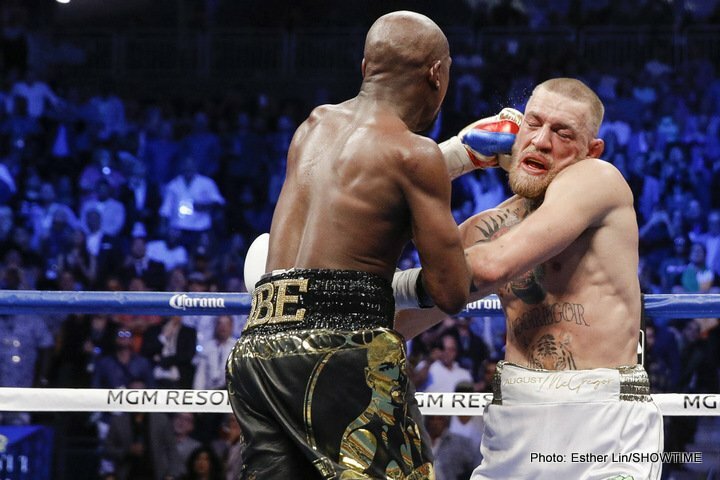 Mayweather was hitting a very tired McGregor at will in round 10, which led to referee Robert Byrd stepping in and stopping the fight. It appeared that Mayweather was purposefully fighting at a very slow pace in order to carry McGregor. Mayweather has never looked this bad before. He looked like an old man until he turned it up a notch in round 9 and 10 to get the stoppage. Even then, Mayweather, 40, looked like a shell of his former self. It’s good that Mayweather wasn’t fighting a top boxer like Keith Thurman. He would have lost badly to Thurman tonight. The 2 years out of the ring really has Mayweather in terms of his skills. The win for Mayweather gives him his 50th win of his career, enabling him to break Rocky Marciano’s 1955 record of 49-0. “He’s a lot better than I thought he’d be. He’s a tough competitor, but ​I​ was the better man tonight. Our game plan was to take our time, go to him, let him shoot his shots early and then take him out down the stretch. We know in MMA he fights for 25 minutes. After 25 minutes, he started to slow down. I guaranteed to everybody that this wouldn’t go the distance.